↑ "Infrared Emission Spectroscopy of BF and AIF" (1995). J. Molecular Spectroscopy 170. doi:10.1006/jmsp.1995.1058. Bibcode: 1995JMoSp.170...82Z. ↑ "Physical-Chemical Properties of beta-Rhombohedral Boron" (October 1973). High Temp. Sci. 5 (5): 349–57. ↑ "Sur la décomposition et la recomposition de l'acide boracique" (1808). Annales de chimie 68: 169–174. ↑ Davy H (1809). "An account of some new analytical researches on the nature of certain bodies, particularly the alkalies, phosphorus, sulphur, carbonaceous matter, and the acids hitherto undecomposed: with some general observations on chemical theory". Philosophical Transactions of the Royal Society of London 99: 39–104. doi:10.1098/rstl.1809.0005. ↑ Szegedi, S. (1990). 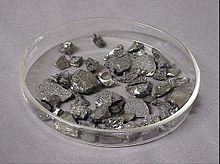 "Determination of boron in glass by neutron transmission method". Journal of Radioanalytical and Nuclear Chemistry Letters 146 (3): 177. doi:10.1007/BF02165219.